Same great product, just a little different. Economical and stylish, the Home `n` Office Drop Over is a Light Duty cord protector used in homes and offices to cover up those exposed cords resting on the floor. 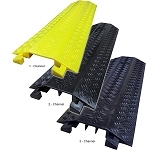 Available in 3 different sizes to fit your needs, the Cable Guard Drop Over Cable Protector will guard your stangnant cables from abuse found in any indoor or warehouse environment. Ideal for office or warehouse use, the Drop Over Lite™ is a durable, length adjustable cord protector that brings neatness and safety to any room. 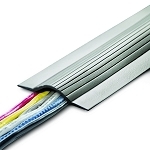 For a fast solution to covering exposed cables, the FastLane™ Drop Over Cable Protector is excellent for indoor use. 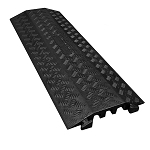 Made from rubber, the Electriduct® Medium Size Cable Cover is flexible enough to contour to any floor, provides superior grip for foot traffic and can handle the harsh elements of outdoor environments. 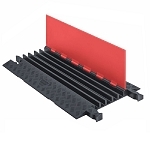 A 3 channel drop over rubber cable protector that can support vehicle traffic and costs a lot less than its polyurethane counterparts. 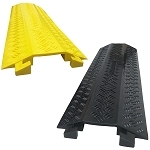 Molded from durable polyethylene, Eagle's parking lot speed bumps are a cost effective solution for traffic safety and control. The Defender Compact is a revolutionary cable protector notably known for it’s extremely low profile. The DO-MAX "Drop and Go" with maximum protection. 5 Models to choose from. Light and Strong, the Heavy Duty Bumble Bee Cable Protector makes carrying/transporting cable protectors a pleasure to those outdoor job sites! Protect industrial cords, electrical cables, hoses or pipes with this heavy duty, 21,000 lbs of load protection drop over. 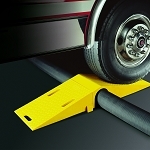 The Linebacker® Single Channel Cable Protector, available in Black or Orange, provides protection for cables and hoses that lay in front of vehicular traffic by giving vehicles a platform in which to drive over without harming cables/hoses. 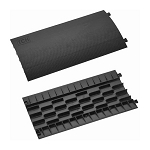 No one carries a wider selection of drop over cord covers and drop over cable covers than Electriduct. From lightweight cable covers for home or office to the heavy duty Goliath drop over cable protectors, we carry the protection you need for the cords and cables that power your world. You want high quality? Electriduct carries trusted brands like Eagle, Drop Trak and FastLane, names that are synonymous with top of the line protective equipment. Electriduct carries the versatile Sidewinder drop over cable protectors, because power doesn't always flow in a straight line. 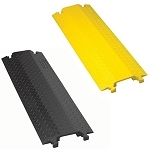 Molded from extremely durable polyethylene with handy T-connectors, they not only offer supreme protection from heavy foot traffic, but reduces tripping hazards, because protection should never come at the cost of safety. 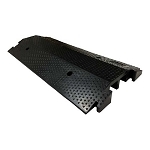 We also offer outdoor drop over cord protectors by Eagle, with parking stops and speed bumps that are load-rated for up to 20,000 lbs and provide multiple channels for versatility. 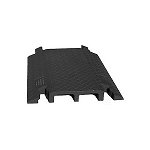 Our curb ramps and dock plates make uneven surface loading problems a thing of the past, with non-slip coating and stout enough to handle 1,000 lbs of whatever you need to move. 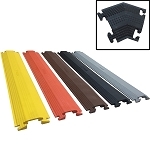 Drop over cable covers serve a number of purposes, and our 3-channel Guard Dog drop over cable protectors add organization to the list, as it keeps everything separated and safe, regardless of what you have rolling over it. Looking for easy re-usability for multiple job sites? Electriduct carries the Do-Max drop over cable protector that is lightweight and easy to store in the back of your truck. 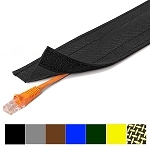 Our medium sized drop over cord covers are manufactured with durable rubber for the flexibility you need and the strength to keep all your important cables, cords and hoses out of harm's way. 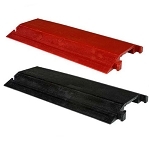 No matter what your drop over cable cover need, check out our selection of drop over cable covers and cord covers and choose the best fit for your job.. If you have any questions regarding Electriduct's drop over cord covers, call our toll-free number at 866-673-9590 any time, to speak with one of our professional and friendly tech support experts. We'll make sure you get the drop over cord covers you want and the value you need. At Electriduct, this is our commitment to you! Drop Over Cable Protectors are as easy to install as the name given to them, they are designed to just drop over cables. 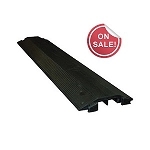 Drop Over Cable Covers varies in size and strength starting from Light Duty (Foot Traffic) to Heavy Duty (Vehicular Traffic) making them perfect for indoor and outdoor jobs. Each design incorporates T-connectors to extend the Drop Over to any desired length. So for that quick fix, just drop over one of these special Cord Protectors to guard your cables from damage and your done! On Sale at $6.99& per foot!